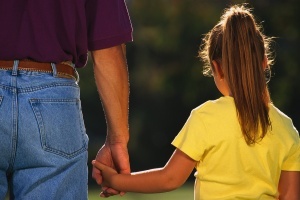 When God Created Fathers- by Erma Bombeck:Inspiration! When the good Lord was creating fathers, He started with a tall frame. A female angel nearby said, "What kind of father is that? If you're going to make children so close to the ground, why have you put fathers up so high? He won't be able to shoot marbles without kneeling, tuck a child in bed without bending or even kiss a child without a lot of stooping. And God smiled and said, "Yes, but if I make him childsize, who would children have to look up to?" And when God made a father's hands, they were large and sinewy. The angel shook her head sadly and said, "Large hands are clumsy. They can't manage diaper pins, small buttons, rubber bands on ponytails or even remove splinters caused by baseball bats." And God smiled and said, "I know, but they're large enough to hold everything a small boy empties from his pockets at the end of a day, yet small enough to cup a child's face." And then God molded long, slim legs and broad shoulders. The angel nearly had a heart attack. "Boy, this is the end of the week, all right," she clucked. "Do you realize you just made a father without a lap? How is he going to pull a child close to him without the kid falling between his legs?" And God smiled and said, "A mother needs a lap. A father needs strong shoulders to pull a sled, balance a boy on a bicycle or hold a sleepy head on the way home from the circus." God was in the middle of creating two of the largest feet anyone had ever seen when the angel could contain herself no longer. "That's not fair. Do you honestly think those large boats are going to dig out of bed early in the morning when the baby cries? Or walk through a small birthday party without crushing at least three of the guests?" And God smiled and said, "They'll work. They'll support a small child who wants to ride a horse to Banbury Cross or scare off mice at the summer cabin or display shoes that will be a challenge to fill." God worked throughout the night, giving the father few words but a firm, authoritive voice and eyes that saw everything but remained calm and tolerant. Finally, almost as an afterthought, He added tears. Then He turned to the angel and said, "Now, are you satisfied that he can love as much as a mother?"